Cesar Chavez was a Mexican-American union leader and labor organizer. He was one of the 20th century’s most dynamic American social activists. He was born on March 31, 1927 in Yuma, Arizona to immigrant parents Juana Estrada and Librado Chavez. His family moved to California in 1939. He had to quit grammar school in 1942 to become a full time farm worker. In 1944, Chavez joined the U.S. Navy and served in the Pacific for two years. After that he continued as a farm worker again. He found the unfair treatment of migrant workers very disturbing. 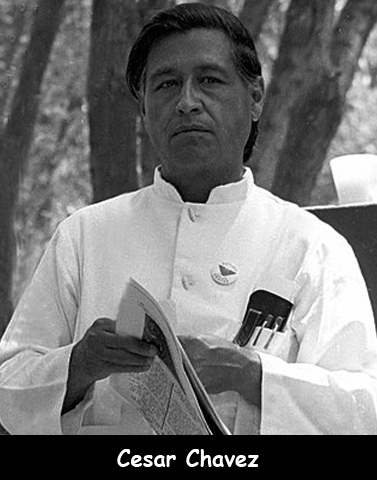 In 1952, Cesar Chavez took a job as an organizer for the Community Service Organization. Chavez became the national director of the Community Service Organization in 1958 and the headquarters moved to Los Angeles, California. He left the CSO in 1962 and co-founded the National Farm Workers Association and the labor leader was Dolores Huerta. In the same year he was offered the position of the head of the Peace Corps for part of Latin America but he denied. He was nominated three times for the Nobel Peace Prize by the American Friends Service Committee in 1971, 1974 and 1975 but he never received it. In 1972, he went on a hunger strike for 24 days. In 1988 he started a hunger strike which lasted for 36 days. There is a United States Navy cargo ship named after him. He died in his sleep on April 23, 1993. He was awarded the Presidential Medal of Freedom shortly after his death. Chavez dedicated his entire life to improving the treatment, pay and working conditions for farm workers.